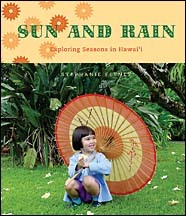 "Sun and Rain: Exploring Seasons in Hawai'i"
Early-education expert Stephanie Feeney presents local families with a worthy alternative to kids' books that discuss the season in terms of falling leaves and snow. In simple text illustrated with color photos, she focuses on more subtle changes in the tropical seasons. In cold weather, for example, we eat more soup and noodles, she writes. The book is illustrated with photographs by David and Sue Boynton, Ron Dahlquist, Moku Kaaloa, Melissa Kim Mosher, Jeff Reese and others. Feeney, professor emerita of education at the University of Hawaii, has written three classic children's books, "A Is for Aloha," "Hawaii Is a Rainbow" and "Sand to Sea." She will appear at book signings 1 p.m. Saturday at Borders Ward Centre and 2 p.m. next Sunday at Borders Windward Mall.